anyone know l01n.bin structure or l01n.bin convert to text file? globeioi wrote: anyone know l01n.bin structure or l01n.bin convert to text file? I think swuforce can help us! How to extract the files? Use Ekey's unpacker (in first post in this thread), or Aluigi's BMS script for Anomaly series. I want know how to translation,Study together. You can use Cartographer to dump text with your table to extract text and use atlas to insert your text. shadowlonely1989 wrote: You can use Cartographer to dump text with your table to extract text and use atlas to insert your text. Is it work? If yeah do normally instruction "how to translate", please. After translated, you can use Atlas to insert text! .idx file repacked by Ekey's Packer is needed to change the header(first 3 bytes) for This War of Mine. And I've added some file names of This War of Mine to FileNames.list. 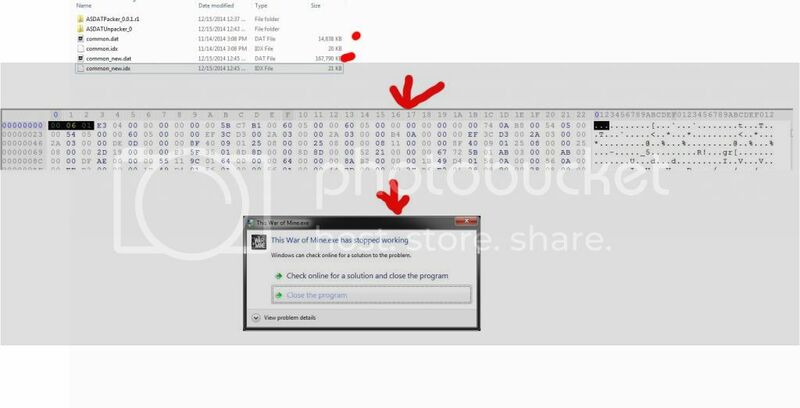 momo wrote: .idx file repacked by Ekey's Packer is needed to change the header(first 3 bytes) for This War of Mine. "This War of Mine" translate into Korean. After the combined file size is over. Size is OK. Packer does not use compression, that's why is file bigger then original.